What started off as a chore I have been putting off for weeks turned out to be a morning of fun, sensory play. If you have been following the 30 days of Hands on Play todays challenge was to play in a sensory tub. We took that challenge outside using the garden as our sensory tub. This past spring and summer we grew a vegetable garden that has long since passed it's prime and become an overgrown mess in our backyard. We went outside with the intention that I would do some work in the garden and the girls would play in the yard but as always happens we all ended up in the same place. It turned out the Bee and The Bean were awesome helpers. They had a great time digging, raking, filling up containers with dirt and dumping them back out. They also helped me to pull out the plants and weeds and put them into the wheelbarrow. 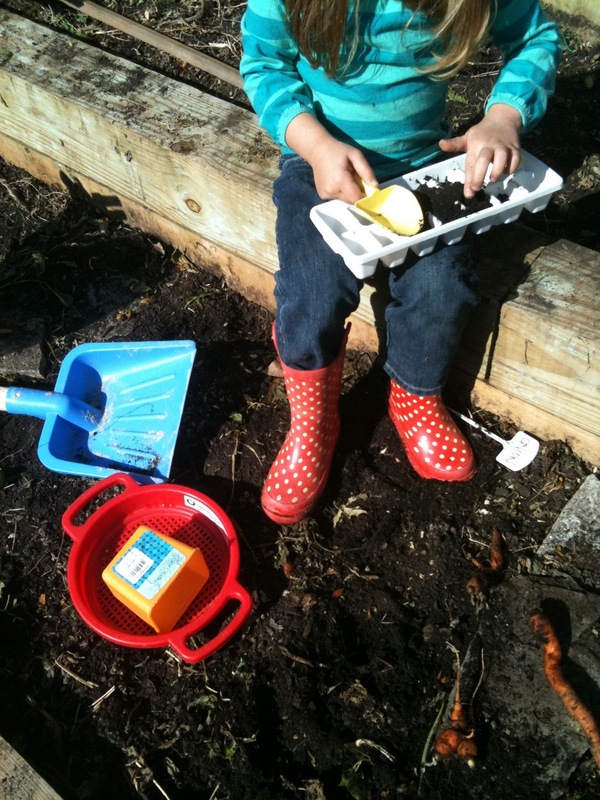 We spent a lot of time sifting dirt and looking for left over tomatoes and carrots in the soil. When it was time to come in for lunch we were all a mess, always a sign of a good morning!